Worf's adoptive brother forces the Enterprise to violate the Prime Directive by beaming a doomed pre-warp colony into the holodeck. There's been a lot of random, never-before-mentioned family members showing up this season, be it Troi's unknown older sister (who happens to be dead), Data's mother, and now Worf's foster brother, in addition to seeing Geordi's parents for the first time. With this one, it seems to be going a bit too far, as though the writers have gone from using family as a tool to develop characters (as they did very well in Season 4) to using them as a crutch. It's been a long time since we've had an episode deal so heavily with the Prime Directive, the most recent one being "First Contact" (and the second most recent goes all the way back to "Who Watches the Watchers"). This is notable since the first two seasons had several episodes about the Prime Directive, which wasn't fully fleshed out until "Pen Pals." "I find no honor in this whatsoever, Captain." I think Nikolai deliberately plays on Picard's use of the word "honor" in order to get under Worf's skin. It's cool to see Stellar Cartography again, which has only appeared once before, in "Lessons." When Crusher confides in Data that the responsibility of locating a suitable planet for the Boraalans is almost too much to bear, she is getting close to expressing the purpose of the Prime Directive: to prevent Starfleet from playing God. I wish the episode delved into this just a little bit more, because by failing to explain why the Prime Directive requires them to abandon a primitive society on the brink of extinction, the episode leaves you with the impression that Starfleet is callous and cruel. It's established early on that the holodeck in which the Baraalans are being held is on Deck 10. Therefore, it is entirely consistent and logical that Vorin, after walking out of the holodeck, should stumble into Ten Forward. Good attention to detail. The young actor who plays Vorin does an exceptionally good job showing abject terror. La Forge says he can stabilize the holodeck in a few hours if they can shut down the program. Wouldn't it be possible to knock out the Baraalans with anesthezine gas or something--call it a strange fog that is part of the storm--and then repair the holodeck while they are asleep or in stasis? That seems less risky than hoping that the holodeck holds out long enough. Granted, having the simulation on the verge of collapse gives the story a necessary sense of urgency. Dobara's pregnancy opens up a whole new can of worms, adding a more concrete and physical form of "contamination" into the Baraalan society. It's pretty messed up that Worf takes some of their Chronicle. This isn't a bad episode, but it's a pretty useless one. It almost explores the Prime Directive a little more, but in the end, it winds up being nothing more than a retread of "Pen Pals" and "Who Watches the Watchers." I also don't understand why the writers felt the need to tackle it through a pretty bland sibling rivalry between Worf and his heretofore-never-even-referenced adoptive brother. 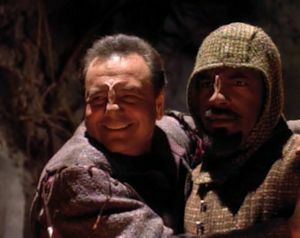 The ending is a little too neat, with Picard and Worf suddenly changing their minds at the last minute and accepting what Nikolai has done for no other reason than his plan worked, and even with Vorin's suicide, there isn't much moral ambiguity in the story's themes (though there definitely should be). I don't like using the term "filler episode," but it's difficult to find a more appropriate label for "Homeward." Penny Johnson, who plays Dobara, the mother of Nikolai's unborn baby, will go on to appear as Kasidy Yates, a recurring character on DS9. She is also well-known to 24 fans as the coniving Sherry Palmer. The best episode for explaining why the Prime Directive seems so cold-blooded is ENT's "Dear Doctor," which in the continuity of Star Trek, actually precedes the Prime Directive to demonstrate what happens without it. It's funny, but Star Trek: Enterprise, in general, does a better job than any other Trek show in hammering out and explaining the purpose behind the Prime Directive. The Son'a attempt a similar method of covert holodeck transport to remove the Ba'ku from their homeworld in Star Trek: Insurrection.